Do your eyes and tastebuds rejoice, but your conscience feel guilty everytime you’re eating shrimps because you’re worried about their cholesterol content? 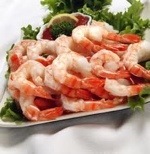 Shrimps, the most delicious seafood are considered perfectly healthy to eat for people with normal cholesterol levels. Shrimps are low in calories and saturated fat, and although they are also high in cholesterol, scientists found that it did not increase the overall cholesterol levels of the study participants. It did show to slightly elevate the LDL or bad cholesterol but it also spiked their HDL, the good cholesterol. If you’re concerned about cholesterol, steam or grill your shrimps and benefit from its many other health-promoting effects that out way the bad. Every 85 g (8oz) of steamed shrimps can provide the body with 48% of the DV of selenium. Lack of selenium in the body has been linked to the incidence of many types of cancer, including prostate. Researchers at the Institute of Food Research (IFR) revealed that a combination of sulforaphane and selenium makes them 13 times more potent in attacking cancer. Sulforaphane-rich foods include broccoli, cabbage and other cruciferous veggies. Shrimps are rich in vitamin B12, a nutrient which supports the production of red blood cells and help prevent pernicious anemia. Fatigue and weakness may indicate low levels of iron in the body. Iron is an essential nutrient needed for energy and vitality and shrimps are rich with this mineral. These crustaceans are loaded with phosphorus. Calcium and phosphorus are the two chief nutrients which work closely together to build strong bones and teeth. Niacin (vitamin B3) helps process fats, carbohydrates and protein and turns it into energy. Shrimps can provide a good amount of this essential vitamin. Just like fish, shrimps can also supply omega-3 fatty acids. Study participants have shown that omega-3’s offer powerful protection against depression and may help improve mood to those who are already suffering from the disorder. Preliminary studies have shown that zinc slow down prostate cancer cell growth. Eating shrimps will add to the body’s needed daily value of this mineral which is only 10-15 mg.
Shrimps can contribute to thyroid health through its supply of copper. Prep Day: Grab a 2 gallon freezer bag. Label it. 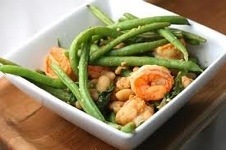 Place green beans and shrimp in 2 gallon bag. Place paprika and garlic in snack bag. Don’t forget to put it in the 2 gallon bag. Freeze. Grab a gallon storage bag for the pantry and label. Fill a small container of olive oil. Fill another small container with salt and vinegar. Place both containers in the gallon storage bag along with the 2 cans of beans. Place in pantry. Serve Day: Thaw garlic paprika mixture in fridge overnight. Thaw shrimp under cold water day of cooking. Chop parsley. Rinse canned beans. Steam green beans as directed, but make sure they stay tender crisp. Steaming will take 4-6 minutes about. Meanwhile, heat oil in a large skillet over medium-high heat. Add garlic and paprika and cook, stirring constantly, until just fragrant but not browned, about 20 seconds. Add shrimp and cook until pink and opaque, about 2 minutes per side. Stir in beans, vinegar and salt; cook, stirring occasionally, until heated through, about 2 minutes. Stir in 1/4 cup parsley. Divide the green beans among 6 plates. Top with the shrimp mixture. Sprinkle with pepper and the remaining 1/4 cup parsley. Serve with quinoa or brown rice.